Small Trachten bag with metal appliqué. Whether used as a clutch, or transformed into a shoulder bag with the attachable, adjustable straps, one thing’s for sure – this blue bag by Schuhmacher doesn’t just make dirndls look great. Finely grained faux leather on the straps, the borders and edging, and the bottom of the bag complement the soft velour leather to give this bag a stylish, harmonious feel. 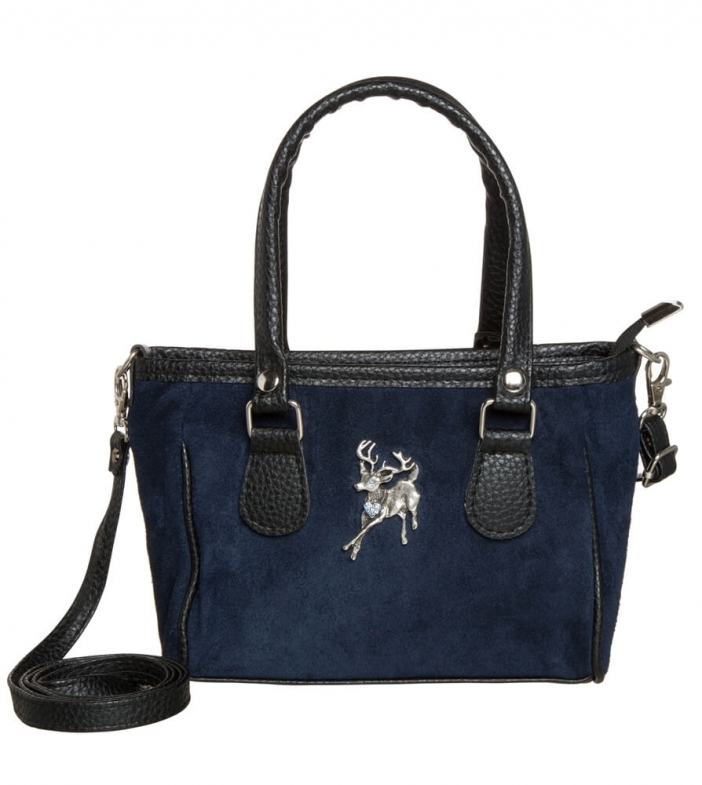 The playful old-silver-coloured stag appliqué at the front of the bag is studded with shimmering rhinestones, catching eyes and evoking a traditional Trachten look. The practical zip fastener ensures that your valuables always stay close and safe, even when you’re partying hard at Oktoberfest! What more could you want?